Perhaps, there is nothing more daring that a musician can do than to perform as a solo acoustic act. Standing alone on stage, an artist is left to take all of the credit for the success of a show. On the other hand, there is no one else to blame for the missteps from which even the most seasoned souls can suffer. It is not an easy feat to captivate an audience with a single song, let alone during a two-hour extravaganza. Yet, some veterans seem compelled to live the life of a troubadour. Over the years, Bruce Cockburn has toured with a variety of different backing bands. He also has spent a great deal of time performing with only the sound of his guitar to support him. Considering the hushed atmospherics of many of the songs in his canon, his music arguably is suited perfectly for this type of framework. In fact, his devoted followers have been waiting a long time for him to pull the trigger on releasing a solo acoustic concert recording. Unfortunately, although Slice O Life most certainly will whet their appetites, it won’t satisfy them completely because it isn’t quite the definitive collection that they have been seeking. The problems that plague Slice O Life occur almost entirely within its second act. 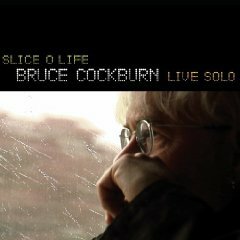 The collection is a composite of shows that Cockburn performed last year, but despite its careful construction, which is designed to simulate the experience of a single concert, the outing ultimately tries to do too much. As a result, Slice O Life not only falls short of its target, but also the diminished intensity of its latter half undermines the overall focus of the effort. At this stage of the game, If I Had a Rocket Launcher and Tie Me at the Crossroads are more serviceable than they are transcendent, while The City Is Hungry, the lone new tune on the album, is considerably less developed and entrancing than some of the other material that Cockburn delivers. Even worse, the extracts from a soundcheck that are tacked onto the conclusion of Slice O Life meander to the point where they leave the endeavor with the inauspicious illusion that it is less satisfying than it really is. Although Slice O Life’s second disc doesn’t make a tremendous impression, fans ought not to ignore the set entirely. In fact, judged solely upon its opening 12 tracks, the album easily ranks among the best outings in Cockburn’s canon. The recording’s crisp clarity captures the pristine, finger-picked patterns that he plays on his guitar, and as the rippling notes unite, they cast beads of sunlight across the troubled waters of World of Wonders. Elsewhere, the circular, rhythmic pulse that drives his material adds layers of pensiveness and gravity to cuts like See You Tomorrow, Last Night of the World, and The End of All Rivers. It should not be surprising, then, that these tracks surround Slice O Life’s highlights.